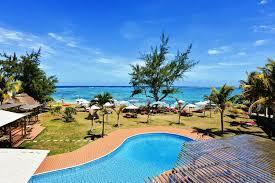 The resort offer you an unforgettable stay with an uncrowded white sandy beach. Overlooking the ocean, the hotel restaurant is designed to create an ambiance of harmony. 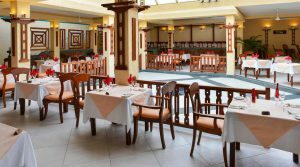 With an ever changing menu, the restaurant offers you option for a unique culinary experience.. The serenity of our air-conditioned rooms are topped with satellite TV and work desk. The private bathroom is fitted with a shower and complimentary toiletries.Rooms There are 32 standard rooms with terrace/balcony located in the main building of Silver Beach Hotel all are sea-facing, 28 Garden view rooms with a terrace/balcony located in 5 two story buildings. Eight of these are interconnecting. Each room has double/twin beds, air-conditioning, bathroom with shower and toilet, telephone, TV, mini bar, personal safe and hair drier. Free Facilities Services Free water sports: Windsurfing, pedalos, kayaks, snorkeling and a free boat trip to Ile Aux Cerfs. Land sports free include Volley ball, French bowling, tennis volley (on the beach), games room with pool table, table tennis and darts. Pay at a nearby hotel for: Scuba diving, Small game fishing, glass bottom boat, water skiing, catamaran cruise, deep sea fishing, speedboat trips, parasailing and horse riding. Other payable services: Boutique, Baby sitting, Laundry, Bicycle and Car hire.